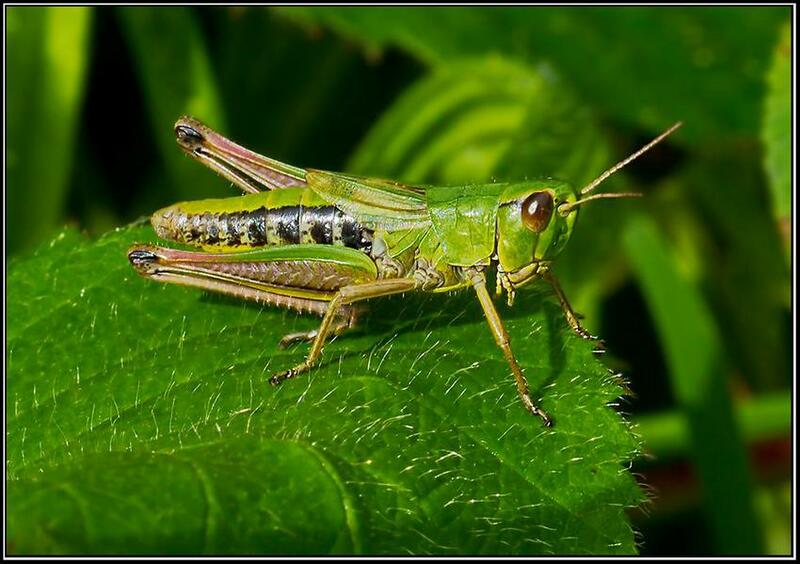 Miss Leak teaches Grasshopper class. She is supported by Mrs Ayadim. We have been learning a model text for 3 weeks. It is an explanation text about ogres. Please get your children to show you the actions. In science we are learning about the body. We completed a experiment which showed us the process of digestion using plastic bags as our stomach, fizzy drink as stomach acid and tights as our intestines. We have been making Greek salad and trying lots of different foods. This half-term we are focussing our learning on different types of natural disasters. 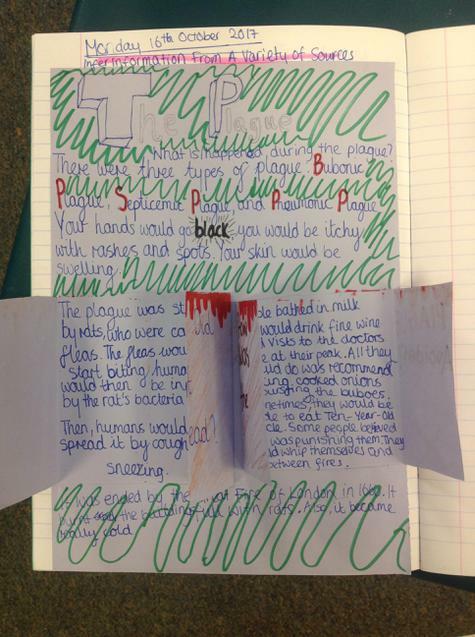 The children have been working hard to produce plans and prototypes of a model or sculpture to represent a natural disaster and have produced some stunning designs. Check back soon for pictures of the finished products! 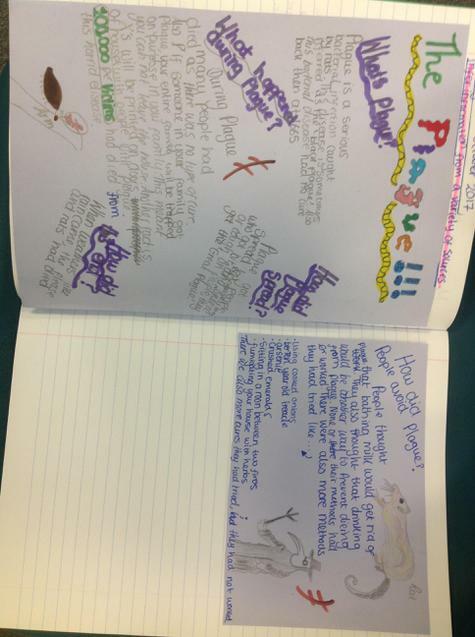 Grasshopper class have this week been learning about the Great Plague and have create some brilliant posters to show what they have discovered. 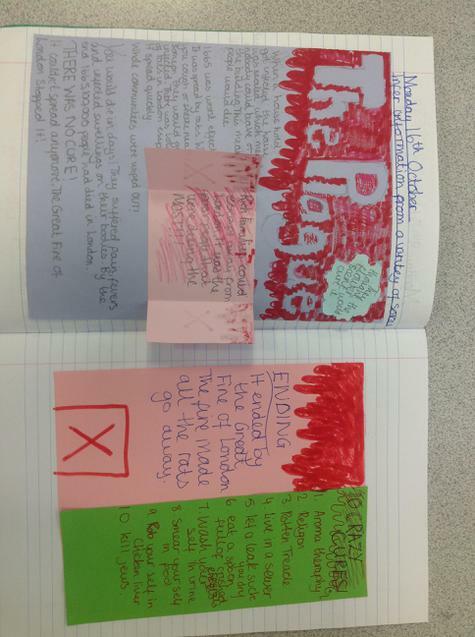 Have a look at these fantastic pieces of work!! Last week, we were lucky enough to visit the British Motor Museum near Warwick. While we were there we had a brilliant time getting up close to a number of incredible cars, classic and modern, as well as being able to get inside a range of different vehicles. The children absolutely loved listening to the amazing staff at the Motor Museum telling them all about life in WW1 Britain. In Grasshopper class, the children have been working together to build sentences about the characters. They worked in pairs and got very creative!! In maths, the children worked hard to solve addition and subtraction problems - the quickest group solved this problem in less than 5 minutes! Grasshopper class have started off this year with the Tudors topic. The children had a great time re-enacting the Battle of Bosworth on the field, where the children loved the opportunity to choose which side they represented (White roses of York or Red roses of Lancaster) and act out the events that unfolded on Bosworth Field in 1485. 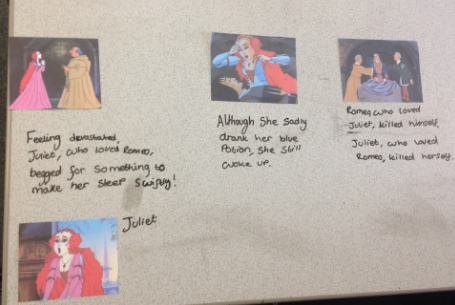 In English, we have begun to study Shakespeare, looking at Romeo and Juliet. 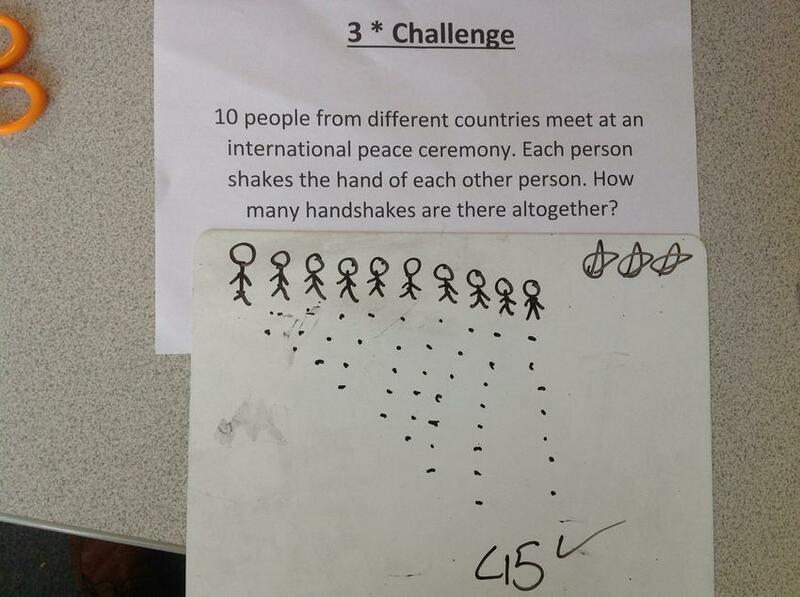 In Maths, the children have been working on their knowledge of Number and Place Value and have enjoyed getting practical with this! Today we have been incredibly busy preparing for the summer fair on July 13th. We have created our own bookmark stall so today we have done market research and prepared the stock. We have really enjoyed ourselves and got more and more creative as the day went on. Please check the rota below and let Mrs Morris know if you need to move your stall duty! Today we have had a wonderful day celebrating the Queen's official birthday! This morning we chose between paint, pastel and collage in order to create our own portrait of Her Majesty. I'm sure you'll agree, they are wonderful! The Queen would be thrilled to hang them up in Buckingham Palace I'm sure! The rest of the day, we have spent researching Her Royal Highness and her family. We created our own exhibitions to share with our families...along with a delicious piece of birthday cake! Thank you so much to all of you who came along, it was lovely to see you all. On Tuesday 9th February, years 5 and 6 were lucky enough to go on a trip to the theatre to watch a stage adaptation of David Walliams' story- Gangsta Granny. In my opinion, if you want a good laugh then this is the play for you. I would give it 4.5 stars because the play was very interactive. The moral of the story is that you should get to know your Gran or Grandpa. We should respect the elderly more. Raj and Flavio are expertly played by Umar Malik. Louise Baily acts impeccably being the Queen. Gilly Tompkins acts as Grandma; her acting is amazing. Benedict Martin plays Dad and Mr Parker. Mr Parker is a nosy-parker. Mum is played beautifully by Linda. At MK Theatre, this amazing showcase is showing. I have watched this myself, trust me that it is my all time favourite play. Secondly, this is a fun time. I would recommend this belter of a play to children aged 9-10 because young ones could get really upset. The overview of the whole plot was not to underestimate the old, to make them happy through their last days. My favourite part was when Granny, expertly played by Gilly Tompkins, and Ben, expertly played by Ashley Cousins, swam across the River Thames and up a sewage pipe to meet the Queen (Louise Baily). I would rate it 10/10 or 5 stars. I would recommend it to a friend, since it was really funny and Jasmin in the dance show was amazingly flexible and did the splits (which I can do!). My favourite characters were the teachers and Jasmin. Jasmin because I loved her routine and the teachers who were always praising Ben. I would recommend it to 9-10 year olds; some of the younger children might not be able to take the ending. In addition to this they may not understand what cancer is. We went to see Gangsta Granny on Tuesday 9th February. This is what we saw. Ben wanted to get some biscuits to fill himself up so he got the biscuit tin down and opened the lid and saw jewels! Ben went to a dancing competition and he was the only male dancer there. Flavio got hit on the head by a man. Raj was my favourite because he was hilarious. I loved the play because the actors were funny and they got us to join in. My favourite part was when they were trying to steal the crown jewels. I didn't like Mr Parker because he was so nosy. I would recommend it to Chelsie because I think she will like the book and because it is funny. We are learning about electricity in Science. Here are some excellent websites for you to explore at home. This week we have been learning about micro-organisms in Science. Here are links to the websites we used, which got us all washing our hands! Vertebrate classification groups Last week we looked at vertebrate classification in Science. This is a useful website which has details about the characteristics of each group.